Proponents of sustainable energy in pursuit of a low-cost solar cell found relief in a widely available and cheap material: tin. Researchers in both the U.S. and the UK are experimenting with tin as an alternative to lead in the production of perovskite solar cells, which convert light energy directly into electricity. Perovskite is a mineral composed mainly of calcium titanate whose structure is ideal for solar conversion. Most perovskite solar cell development has relied on lead to absorb sunlight, but the new studies, both released this week, make the case for using tin because it’s a less toxic material than lead. “Tin is an inexpensive, abundant material and its use in solar cells would drive costs down while alleviating the kind of geopolitical supply chain issues that bedevil other solar cell materials,” Tina Casey, who writes about sustainability and new materials, notes in Clean Technica. Solar panels are quickly becoming a global product. While the cost of solar panels varies widely, depending on their type and efficiency, overall, they’re becoming more affordable. According to Cost of Solar, solar panels are about half the price they were in 2000 and 100 times the price they were in 1977. Today, solar costs about $0.70 to$0.73 per watt, although factoring in the “soft costs” of solar – things like installation and obtaining permits – can drive the prices up to about $4.72 per watt. One of the studies focused on using tin in solar cells to drive down cost is from researchers at Northwestern University in Illinois. Their design for a new solar cell consists of five layers. The first two layers are of conducting glass and a layer of titanium dioxide. Then there’s the sheet of tin, followed by a coat of the electrical circuit. Finally, there’s a gold cap, which forms the back contact electrode of the cell. Scientists in the UK have done similar experiments with using tin in perovskite solar cells and also report success with the material. “The demonstration of solar cells using tin-based perovskites is a clear indication that good solar cell operation is not unique to lead, and therefore also opens up the use of other similar metals in the perovskite structure, leading to a multitude of new research avenues for optimising these materials,” Henry Snaith, the lead author of a study published in the journal Energy & Environmental Science, said in a statement. The one downside to using tin in lieu of lead in solar cells is less efficiency. The UK team reported that their prototype demonstrated about 6 percent efficiency at turning sunlight into electricity – the U.S. team’s design achieved about the same – but researchers believe with more development that the solar cells can reach an efficiency closer to 20 percent. Leading solar cell technology has roughly 25 percent conversion efficiency, according to Gizmag. The Department of Energy (DOE) is looking to expand the solar power allocation under the Feed-in-Tariff scheme to 500 megawatts from the current 50 megawatts. Hence, the DOE is considering allowing more solar power development with guaranteed power rates to boost supply during summer, when electricity reserves are often tight, Petilla said. “The profile of solar really fits summer. We have the highest [production] in summer and in terms of pricing it actually works,” Petilla said, adding he hoped the allocation can be amended within the year following certification from the National Renewable Energy Board (NREB) that the current allocation of 50 MW is not enough. The Energy Regulatory Commission (ERC) needs to approve the proposed additional allocation and it has asked for NREB’s endorsement. As for the price impact, Petilla said NREB had conducted a study and found that the pass-on impact for an additional 450-MW under FIT is just up to P0.04 per kWh. “It can be zero. It can be negative, even, during summer,” Petilla said, referring to the high solar power production and very expensive power spot market costs during the summer season. The DOE’s FIT allocation for solar power is only 50 MW but so far 80 MW of capacity have been committed by various players. “It’s a race on whoever finishes registered projects first,” DOE director for renewable energy Mario C. Marasigan said. He was referring to the oversubscription in solar energy projects under FIT, which guarantees rates to be paid to developer-generators, and the DOE’s first-come, first-served policy on FIT allocation. NRG Energy and MidAmerican Solar unveiled the new king in solar photovoltaic (PV) facilities this week. Located on 2,400 acres of land between Yuma and Phoenix, AZ, Agua Caliente is now operational as the world’s largest PV solar facility in the world. The 290-megawatt (MW) project uses solar energy to avoid the annual emission of about 324,000 tons of carbon dioxide into the atmosphere—equivalent to taking nearly 70,000 cars off the road. Under a 25-year power purchase agreement, NRG and MidAmerican sell solar power to Pacific Gas & Electric Co. At peak capacity, the plant will generate enough energy to power 230,000 homes. NRG was also involved in another record-setting solar project this year—the launch of Ivanpah, the world’s largest concentrating solar thermal power plant. “Proving that we can build both the world’s largest solar thermal and now one of the world’s largest solar photovoltaic facilities advance NRG’s mission to reshape the energy landscape that is incredibly beneficial to both the economy and in how we produce and consume energy,” Tom Doyle, president of NRG Solar, said in a statement. FirstSolar designed and constructed the project using advanced thin-film PV modules and will operate and maintain the facility for NRG and MidAmerican Solar. Peter W. Davidson, executive director of the Loan Programs Office (LPO) said the energy companies received a $967 million loan guarantee for Agua Caliente. In a blog post for the U.S. Department of Energy, Davidson displayed pride in aiding clean energy. “Despite the strong and consistent public demand for greater development of solar energy, these achievements seemed more aspirational than attainable in 2009 , given the state of financial markets at the time,” Davidson wrote. “However, with the help of loan guarantees, these projects were able to move forward. Agua Caliente is the largest of 10 operational utility-scale solar PV facilities in three states that NRG has an ownership interest in. By this time next year, it may no longer be the largest PV plant, as work continues on another MidAmerican project, the 550 MW Topaz Solar Farm in San Luis Obispo County, CA. “In 2012, our company made a commitment to invest in its first utility-scale solar project to foster economic development while demonstrating our commitment to the environment,” said Richard Weech, chief financial officer of MidAmerican Renewables. DAVAO CITY – Just as when everyone was counting on finding some relief in an additional 105 megawatts of power to shorten the city’s four-to-six-hour brownouts, Steag’s State Power Inc. announced it could not get one of its rehabilitated units back on stream as initially scheduled on Sunday. “While the repairs and restoration works of Unit 2 is substantially completed, the company needs more time to ensure that the unit is in excellent condition prior to commissioning and synchronization to the Mindanao grid,” SPI power plant manager Dr. Carsten Evers said in a statement. Art Milan, executive vice president and corporate operating officer of the Davao Light and Power Company (DLPC), told a forum here on Friday the company was looking forward to the reinstatement of the unit as it would provide additional 105 MW to the Mindanao grid. Milan said this would result in shorter brownouts. “Possibly, if one of the Steag’s units will finally run on Sunday, we might no longer experience brownouts during off peak hours,” said Milan, who spoke at a forum attended by barangay (village) captains, military officers and Mayor Rodrigo Duterte. He said the city was experiencing a supply shortfall of 113 MW of power, or at least one-third of the 330 MW daily demand. The shortfall, he said, caused the rotating four-to-six-hour brownouts. DLPC is owned by the Aboitiz group, which operates power generating plants. This fact raised questions among consumers as other power utilities, which do not have generating capabilities, were brownout-free. Evers said SPI might finally recommission the comnpany’s Unit 2 on or before May 8 while the target date for restoring Unit 1 is on June 1. “We apologize for this delay and rest assured that we are doing everything we can to bring the units back to the grid,” Evers said. The two identical power generation sets of the Mindanao coal-fired power facility, each having some 105 MW capacity, have been undergoing repairs after sustaining damage to their turbine-electric generating sets during the February 24 Mindanao-wide blackout. According to the agreement, Google will commit up to $100 million, with SunPower committing approximately $150 million. Thousands of homeowners are expected to finance solar power systems through SunPower solar leases as a result of this program, joining approximately 20,000 Americans already leasing from SunPower. Chuck Boynton, SunPower chief financial officer, agreed, adding that the funding will help make solar accessible to more families and allow those families to take control of their energy costs. “With the increased and growing interest in reliable, cost-effective solar from businesses and homeowners alike, Google’s leadership is helping take solar mainstream,” he said. This agreement represents Google’s 16th renewable energy investment and its third residential rooftop solar investment. Overall, Google has invested more than $1 billion in renewable energy projects on three continents and across a range of technologies. Together, these projects can generate more than 2GW — enough electricity each year to power approximately 500,000 U.S. homes. But first, back to the original report. There were a couple of major takeaways in this: One, the addressable solar market in the US is way bigger than anyone had previously imagined; and two, the Tesla gigawatt battery manufacturing facility could bring down the cost of storage quicker than anyone had imagined. Even without the continuation of the 30 per cent investment tax credit – and taking into account the fact that many homes are unsuitable for solar – Morgan Stanley says its “base case” addressable market for distributed solar in the US is 240GW within five years. WASHINGTON — The White House Thursday announced a series of measures aimed at increasing solar energy production in the United States, particularly by encouraging the installation of solar panels in public spaces. President Barack Obama and his Democratic allies in Congress want laws to fight climate change and reduce greenhouse gas emissions, but Republicans, who hold the majority in the House of Representatives, have blocked all legislative efforts since 2011. In response, the president has switched tactics, using his regulatory and administrative powers to enact his climate change policies. Thursday, the White House launched a program to encourage federal agencies, military installations, and publicly-subsidized buildings in the Washington area to install more solar panels on roofs, covered parking garages and open land. And, earlier in the week, the Energy Department guaranteed at least $2.5 billion in loans for “innovative” solar projects. The Environmental Protection Agency also pledged Thursday to double the use of renewable energy at its network of 1,500 partners organizations — including schools, public buildings, and businesses — within the next 10 years. Another $15 million will be dedicated to local initiatives to boost solar capacity. According to the White House, the United States today can generate up to 13 gigawatts of energy from solar power, or enough to power 2.2 million homes, up from just 1.2 gigawatts in 2008. The federal government is working on granting permits which by 2020 would generate enough power to support six million households, it added. 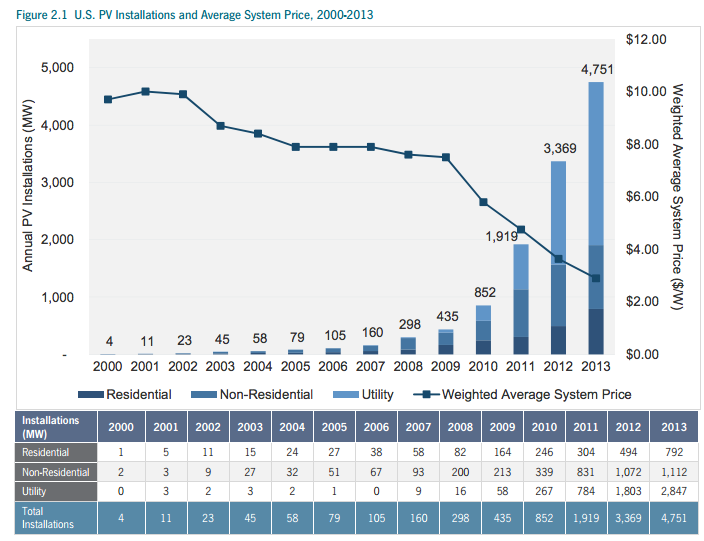 The average cost of solar panels has dropped more than 60 percent since the beginning of 2010, the White House said. The president also has significant leverage to influence on carbon emission levels through limiting the federal government’s energy consumption, especially within the Defense Department, which is the biggest energy consumer in the country. It’s now a question of how and where, not if, solar becomes a dominant force in energy markets. AllianceBernstein’s Michael Parker and Flora Chang published a note last week with the following chart showing how rapidly the cost of solar on a real-dollars-per-million-BTU equivalent basis has, in many instances, come to match that of conventional fuels. Nothing else looks like this. 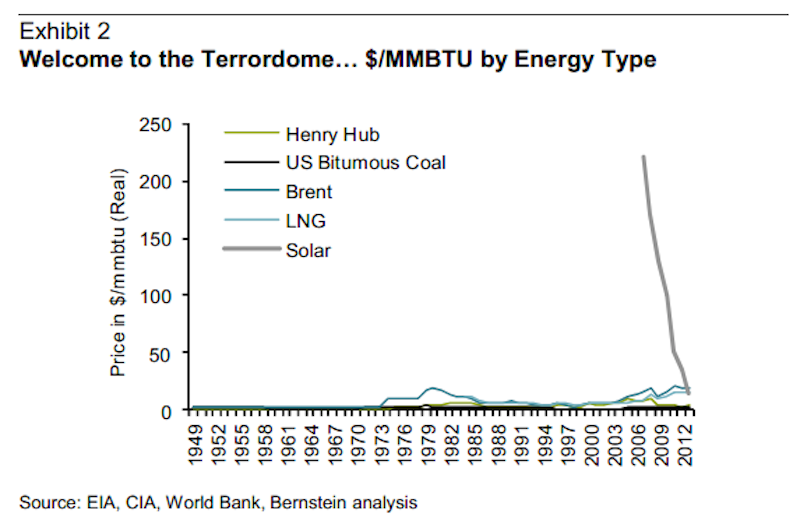 And the title of the chart, Welcome to the Terrordome, reflects this almost violent decline in solar pricing. Exhibit 2 is the chart the solar industry has been working towards for 60 years. Solar is now – in the right conditions – cheaper than oil and Asian LNG on an MMBTU basis. Yes, we are using utility- scale solar costs in developing markets with lots of sun. But that describes the growth markets for global energy today. For these markets solar is just cheap, clean, convenient, reliable energy. And since it is a technology, it will get even cheaper over time. Fossil fuel extraction costs will keep rising. There is a massive global market for cheap energy and that market is oblivious to policy changes at the NDRC, MITI, the EU or the CPUC. As solar costs fall, the price that end markets will pay for solar energy is set by oil and remains unchanged. The solar industry (upstream and downstream) collects all of the value created by improvements in the technology. The behavior from here seems clear: the solar industry will expand. Retaliatory steps from distribution utilities will increase the market for cost-effective battery storage. This becomes – initially – a secondary market for battery technologies being developed for the auto sector. A failed battery technology in the auto sector (too hot, too heavy, too rigid a form factor) might well be perfect for the home energy storage market…. with an addressable end market of 2 billion backyards. …the risk is that I am being too conservative. It may be that oil and gas producers sitting on large reserves will not wait for deflating energy prices a decade from now before changing behavior. Rather, the expectation of energy deflation may be enough. If the downward sloping forward curve is ever accepted as permanent, rational behavior from energy producers will guarantee it is so. Sitting on oil and gas reserves for the benefit of generations yet to come ceases to be a rational strategy if that reserve represents a depreciating rather than an appreciating asset. This is the hidden flaw with the “equal and opposite/ too small to matter” formulation. Ultimately what may kill the solar sector – and every other part of the energy market – for equity investors is not renewable technology and battery storage turning into behemoths, but the realization of that future as inevitable. Roughly 29pc of electricity capacity added in America last year came from solar, rising to 100pc even in Massachusetts and Vermont. “More solar has been installed in the US in the past 18 months than in 30 years,” says the US Solar Energy Industries Association (SEIA). California’s subsidy pot is drying up but new solar has hardly missed a beat. The technology is improving so fast – helped by the US military – that it has achieved a virtuous circle. Michael Parker and Flora Chang, at Sanford Bernstein, say we entering a new order of “global energy deflation” that must ineluctably erode the viability of oil, gas and the fossil fuel nexus over time. 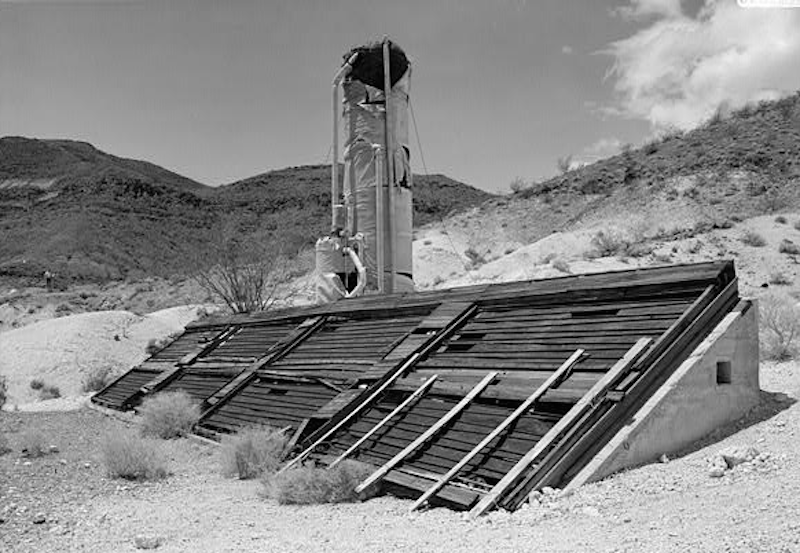 In the 1980s solar development was stopped in its tracks by the slump in oil prices. By now it has surely crossed the threshold irreversibly. But the technology momentum goes only one way. “Eventually solar will become so large that there will be consequences everywhere,” they said. This remarkable overthrow of everything we take for granted in world energy politics may occur within “the better part of a decade”. The Saudis are themselves betting on solar, investing more than $100bn in 41 gigawatts (GW) of capacity, enough to cover 30pc of their power needs by 2030 rather than burning fossil fuel needed for exports. Most of the Gulf states have comparable plans. 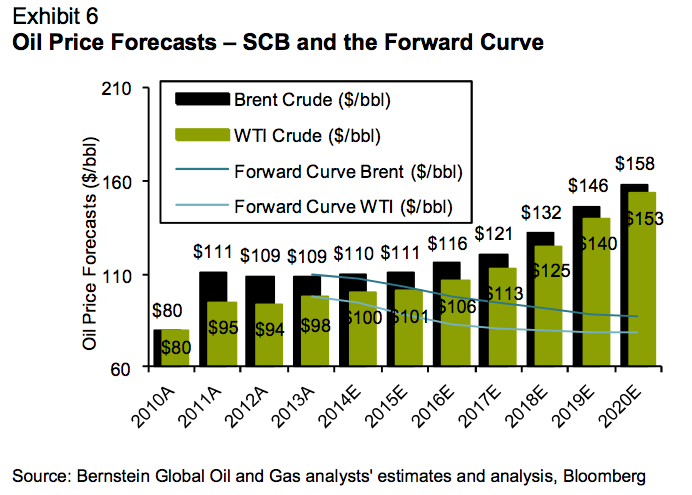 That will mean more crude – ceteris paribus – washing into a deflating global energy market. Clean Energy Trends says new solar installations overtook wind turbines worldwide last year with an extra 36.5GW. China alone accounted for a third. Wind is still ahead with 2.5 times old capacity but the “solar sorpasso” will be reached in 2021 as photovoltaic (PV) costs keep falling. The US National Renewable Energy Laboratory says scientists can now capture 31.1pc of the sun’s energy with a 111-V Solar Cell, a world record but soon to be beaten again no doubt. This will find its way briskly into routine use. Wind cannot keep pace. It is static by comparison, a regional niche at best. A McKinsey study said the average cost of installed solar power in the US across all sectors has dropped to $2.59 from more than $6 a watt in 2010. It expects this fall to $2.30 by next year and $1.60 by 2020. This will put solar within “striking distance” of coal and gas, it said. It is hard to keep up with the cascade of research papers emerging from brain-trusts in North America, Europe and Japan, so many brimming with optimism. The University of Buffalo has developed a nanoscale microchip able to capture a “rainbow” of wavelengths and absorb far more light. A team at Oxford is pioneering use of perovskite, an abundant material that is cheaper than silicon and produces 40pc more voltage. One by one, the seemingly intractable obstacles are being conquered. Israel’s Ecoppia has just begun using robots to clean the panels of its Ketura Sun park in the Negev desert without the use of water, until now a big constraint. It is beautifully simple. Soft microfibers sweep away 99pc of the dust each night with the help of airflows. Even thermal solar is coming of age, driven for now by use of molten salts to store heat and release power hours later. California opened the world’s biggest solar thermal park in February in the Mojave desert – the Ivanpah project, co-owned by Google and BrightSource Energy – able to produce power for almost 100,000 homes by reflecting sunlight from 170,000 mirrors onto boilers that generate electricity from steam. Ivanpah still relies on subsidies but a new SunPower project in Chile will go naked, selling 70 megawatts into the spot market. Deutsche Bank say there are already 19 regional markets around the world that have achieved “grid parity”, meaning that PV solar panels can match or undercut local electricity prices without subsidy: California, Chile, Australia, Turkey, Israel, Germany, Japan, Italy, Spain and Greece, for residential power, as well as Mexico and China for industrial power. Utilities that fail to adapt fast will face “disaster”. Solar competes directly. Each year it is supplying a bigger chunk of peak power needs in the middle of the day when air conditioners and factories are both at full throttle. “Demand during what was one of the most profitable times of the day disappears,” said the report. They cannot raise prices to claw back lost income. That would merely accelerate what they most fear. They are trapped. Michael Liebreich, from Bloomberg New Energy Finance, says we can already discern the moment of “peak fossil fuels” around 2030, the tipping point when the world starts using less coal, oil and gas in absolute terms, but because they cannot compete, not because they are running out. For Germany it is a bitter-sweet vindication. The country sank €100bn into feed-in tariffs or in solar companies that blazed the trail, did us all a favour, and mostly went bankrupt, displaced by copy-cat competitors in China. The Germans have the world’s biggest solar infrastructure, but latecomers can now tap futuristic technology. For the world it portends a once-in-a-century upset of the geostrategic order. Sheikh Ahmed-Zaki Yamani, the veteran Saudi oil minister, saw the writing on the wall long ago. “Thirty years from now there will be a huge amount of oil – and no buyers. Oil will be left in the ground. The Stone Age came to an end, not because we had a lack of stones, and the oil age will come to an end not because we have a lack of oil,” he told The Telegraph in 2000. Wise old owl.